2013 Press Pass Showcase Football is the company's premium release focusing on the year's rookie class. A hits-only release, every box come with just one pack. But that pack has six autographs and a game-used memorabilia card. Base autographs are printed on plastic card stock. The checklist, limited to around 50 players, includes only the best prospects available in the 2013 NFL Draft. 2013 Press Pass Showcase Football also has three autograph inserts printed on foil stock: Class of 2013, End Zone and Fantasy Team. 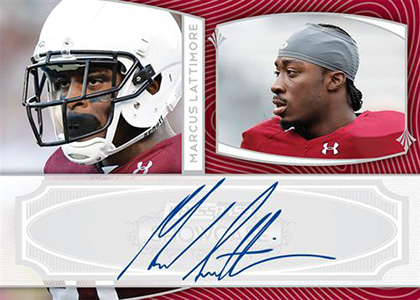 The autograph lineup rounds out with Andrew Luck and Robert Griffin III cut signatures. 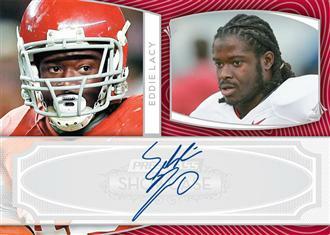 All 2013 Press Pass Showcase Football autographs are serial numbered. 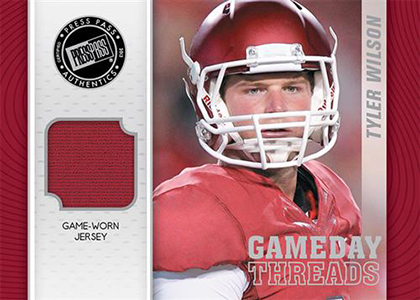 Game-used jersey cards come in the form of Gameday Threads. Using both regular jersey swatches and premium patch pieces, the checklist has just a handful of players. Every 2013 Press Pass Showcase Football half-case of ten boxes has a hot box with ten autographs. Click here for the 2013 Press Pass Showcase Football checklist. michael � Nothing released as of yet. We’ll check on Tuesday after the holiday. michael � Just because a product isn’t widely available doesn’t mean it bombed. It’s possible they weren’t trying to create a mass product, much like a lot of non-Hollywood movies do. The lack of college license turns off some collectors, for sure, though. Looks like it might only have the autographs though. Great product. Clean look. Not as flashy as some other cards but, still very nice. I am a fan of the simple design. Pulled a 1/1 Robert Griffin III Baylor game worn jersey patch in my third or fourth box. Pretty cool stuff.